As we dig deeper, however, I usually discover they have one thing in common: no global strategy tying all those tactics together into a cohesive plan. They’ve just been throwing spaghetti at the wall to see what sticks — and spaghetti is not a strategy. As different as all the businesses I work with are (from a guy who sells men’s clothing to a woman who coaches people through healing IBS and beyond), I start every Strategy Session with three basic questions. The answers to those questions guide me as I craft a big-picture strategy to help them get the results they’re dreaming of, and they can help you do the same. Question #1: What is your goal? It all comes down to your goals. When I ask clients about their content marketing goals, their answers determine my suggestions and strategy. Because the goal dictates the strategy. Say it again for the people in the back: The Goal Dictates The Strategy. But more often than you might guess, my clients don’t know what the goal for their content is. I recently got on a consult call and asked the client this exact question. She told me her practice is full, and she wants to keep blogging every week just to maintain her online presence — so when someone comes to her website, it looks current and relevant. Okay, that’s legit, but when we dug deeper, she mentioned she’s planning to launch an online course next year to help her scale. That’s when mauve warning lights started flashing in my brain. Suddenly, blogging every week just so the lights are on is no longer a strategy. We want to collect email addresses and leads, nurture them, and get them to the point they will happily fling money at her as soon as she announces her course. Her goal was to sell a course in the future. And she knew her current content wasn’t attracting a lot of leads or the right kind of leads. Yet she didn’t see that her content could solve those problems now — instead of waiting until six weeks before her launch. Sometimes identifying how content will support business goals is challenging. But when you have a clear goal, we can work backwards to find a content strategy to support it. Question #2: How will you track your progress? I used to be big time anti-numbers in my business. But then I saw how easily one can apply some math to business goals in order to see better, faster results, and I was hooked. In order for this mathmagic to work, however, you must focus on the right numbers. Because focusing on the wrong numbers can make things worse. Let’s say, for example, you decide to focus all your efforts on getting more downloads of your podcast. You design a strategy, and it works! Downloads go through the roof. Then it comes time to launch your thing and … it goes poorly. You don’t have enough new leads, so you don’t make your sales goals. If the overall business goal was sales, then the number of downloads of a podcast is the wrong metric to track — because, in this example, downloads don’t correlate to sales. I see the same thing happen with my clients all the time. If they’re tracking any metrics at all, they choose to focus on something like the number of comments they get on a post or the number of shares and retweets. But those things don’t actually reflect their goals. Those numbers are vanity metrics. They feed our egos — but don’t necessarily translate to more business. You may have seen this for yourself when a post got a lot of likes or comments, but you didn’t see a corresponding uptick in leads or sales. And that is why so many people get frustrated with blogging and content marketing in their businesses! Because they aren’t focused on the right metrics for their goals, they never see the results they want. Once a client and I determine their goals during a Strategy Session, we take the time to ask ourselves what metrics will indicate progress toward the goal … or not. Question #3: How will you get there? Once I know the answers to Question #1 and Question #2, that’s when the fun starts. My brain juices start flowing and we start brainstorming and crafting a strategy to move the business closer to its goals. But the strategy depends on the answers to the first two questions. Without those goal posts, I can’t build an effective strategy for a client — and you can’t build one for yourself. If the goal is to build up their list in order to sell something in a few weeks, my suggestions are going to be different than if they want to sell something in a few months. If they want to get people on a phone call, my suggestions are going to be different than if they want to get people on a webinar. If they’re selling high-end consulting services or a $50,000 mastermind, my suggestions are going to be different than for the person selling a $59 drip email course. Back in 2016, my big business goal was to increase the percentage of my revenue coming from course sales. I knew email leads were the metric I needed to track, so I spent the first half of the year growing my email list, and I tripled my list in just under six months. Then I launched my signature course. Everything went well, my launch converted at 4.5 percent, and I reached my goal. But I was exhausted. I decided I didn’t want to be on the launching hamster wheel anymore, and I wanted to go back to doing high-end consulting work. Curious, I polled my list asking a very simple question: Were they more interested in things like DIY courses or one-on-one support? Just over one percent of my list said they were interested in what I wanted to sell. The lesson? The strategy that got me to my goals in 2016 was no longer going to be effective in 2017 and beyond. And that’s okay. I changed my strategy and I’ve doubled my revenue since then. But if I’d stuck with a strategy aligned to the wrong goals, focused on the wrong metrics, I wouldn’t have had that kind of success. 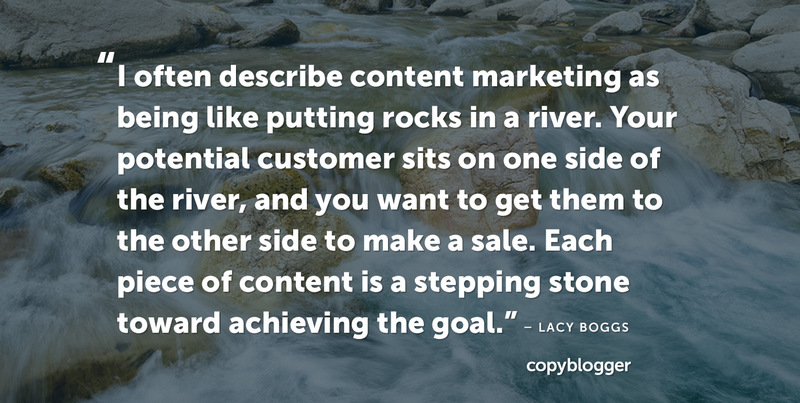 I often describe content marketing as being like putting rocks in a river. Your potential customer sits on one side of the river, and you want to get them to the other side to make a sale. Each piece of content is a stepping stone toward achieving the goal. You have to offer the right kind of content-rocks, the right distance apart, at the right frequency. Otherwise, your customer falls into the river and washes downstream, never to be heard from again. But so many business owners are just tossing rocks into the river at random. Big rocks, small rocks, blogs and podcasts, live videos and Snapchats, with no thought to how, or even if, the content will help the customer make the journey to a sale. It’s a huge waste of time, energy, and resources. The problem isn’t that these businesses don’t have a goal; almost every business owner you talk to knows her goal is to make more sales. It isn’t that they need a new tactic. We are drowning in marketing tactics to try, new platforms to be on, and trends to follow. The problem is that they’re not aligning the content they’re producing and the strategy they’re following with the goal. But when you choose the right rocks in the right places at the right time, and know how they work together to lead to a sale, you can create a content strategy that has a real impact on your business. Question #3 gives you clarity and confidence Lacy. Figuring out how to get there just makes everything so much easier. Focus on a few core strategies guys; master a few versus being a jack of all trades. Rocking post. This is so true, Lacy. Often clients get bogged down on getting traffic while they wish to make more money from their subscribers and increase their sales. No clear goals, no clear results. It’s as simple as you make it, define a goal, define a KPI, define a path to achieve it. The last point, and one of the hardest when it comes to content, is to track the results, especially given content is so damn hard to track. Attribution for content is a PITA, but it’s worth doing if you want to justify your client’s investment. Still, that’s something for another post (that’s an idea for a next post right there!). Such a treat to have you on Copyblogger, Lacy! Loved this post — and it’s a great illustration that there’s no such thing as one single content strategy. It depends so much on the details of who, what, when, and why. You make great points, but I’d like to suggest that what you’re discussing is a content marketing strategy, not a content strategy, which would have a broader focus. Though it may seem like not picking, the terms can sometimes be so vague in our field, it’s worth trying to keep them consistent. Hmm… I guess I use them interchangeable. How would you define content strategy? “Content strategy is about how you get content created, whether in-house, with the help of freelancers, or by hiring an agency. It also involves how to spread that content once it’s created. Ha! I should have known! Straight from the expert’s mouth/pen/keyboard. I used the terms interchangeably too until Robert Rose set me straight on it. Makes sense, but ultimately most people just need some strategy period, you know? Glad to see you writing here (secret fan). I was a stickler about the difference between content strategy and content marketing strategy after you wrote about it last year, via Robert Rose. But then how we talk about strategy seemed to evolve past the distinction, and I didn’t find it as useful anymore. I’ve been a fan (and student) of Lacy’s for a while now and I think this post is spot-on. I’m a writer and I built a list using one lead magnet (a collection of short stories) but then tried to launch fantasy novels to that list. Unsurprisingly, people weren’t really interested. But they ARE interested in other things I send them, so I’ll use that to pivot in a new direction! Tracking things makes it so much easier to see the bigger picture. Lovely to see you here, Icy! Thanks! What you said in the opening about how site owners are complaining that they’ve “tried it all!”. This part rings true for me. And, this is an issue I’m constantly facing. I’ve been a blogger and telecommuter since my daughter was born (about 15 years ago). I don’t depend on an outside job for family income. And, it’s an ideal solution for my family. But the thing that always gets me is when starting a site, there are a lot of little boxes you have to tick, like starting that email list. And, you think this is going to be the solution? And, then to find out (as you said), that such a small percentage of your email list actually care and who knows why the rest signed up. All these places you can use to drive traffic to your site and yet none of them working sometimes other than to just get traffic. But is that actually resulting in conversions? Sales? Is there any real income going on? This is my other constant gripe. So many circuitous routes to get to the money. We build information rich sites and people come there to get that free info and happy to take it, but not wanting to invest in courses, info seminars, etc. I guess the strategy now is different than when I started 15 years ago. Anyway, thanks so much for your insight into this issue. I think you’re right, Beverly — the landscape HAS changed dramatically in the past 15 years. I don’t know what your blog is about, but I would suggest a couple of things: First, take a hard look at your lead magnet, and ask yourself if it’s really aligned with what you want to sell. A trick I often use is to ask myself, “What does the customer need right BEFORE they decide to invest with me?” and make THAT my lead magnet. Thanks for your thoughts and comments! You’re not alone. This is a wonderful post that applies not only to a content strategy but also to how businesses function. Is it 1 or 100 more? That could also affect the strategy. Businesses need to be specific so that a content marketer can understand clearly what failure or success means. Absolutely! The goal needs to be specific and a correct measure. Thanks for your comment!